How do I describe F.B. 's celebration gig of the Mac's 50 years n still goin' strong tour? A* list ? Meta-stellar? No, doesn't cut it. So ,I have had to create a new word- OMGasmic and of 2 hours duration too. Sustained and spectacularly satisfying. You should have had what we were having at a packed, sold out(again) 'Pot! Oh yeh and Matt as LIndsey Buckingham n P.G. on lead guitar n vox took even that to a new level with a superb,individual performance which can only be described as multi-OMGish. More stage-presence than Depp n Di Caprio combined, more energy than a Lucozade factory, Matt whiddled, wailed and wah-wahed the heaven out of his stringed orgasmatron to musical, Everestian heights of delight. And the rest of the band weren't half bad either!! 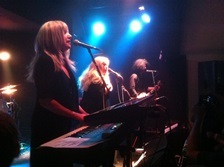 Lisa/Stevie and Maria/Christine were 2 smooth molasses-larynxed ladies who took it in turns to sing their solos superbly and harmonise seemingly effortlessly on all F.M. 's perfect for F.M. Radio pop-rock classics. Bassist Mel/John Mc. and percussionista Dave/Fleetwood Mick(lol) provided the more than essential mortar in the F.B. U.K./U.S.-( Mexican?) wall of sound with Dave absolutely aceing it in drum-driven pearler Tusk. The songs? The set-list ? They did 'em all except Albatross. But with such uber-quality in quantity, who gives a 'tross on such a night? My personal faves? - Matt's stormin' Oh Well n (Pete) Green Manalishi from the old stuff and basically everything else as we were OMGd up to the eyeballs in musical magnificence. Then again, a gig dated 7/7/17 was always gonna be a heavenly, perfect affair. (Band formed in '67, n Rumours(nearly 50 million units sold !) came out in '77. 'All the sevens!!' Five stars (all of 'em ). Seven Wonders (inc. Pete Green(baum) n Mick's wife ?!) And a super shout-out 12 out of 10 on the Riffter Scale for main-man Matt. Absolutely bloomin' smokin'! Fret-tastic!